The Future of Toothpaste you'll go cocoNUTS for! Our all-natural toothpaste combines the antibacterial properties of MCT oil (fractionated coconut oil) with the natural detoxifying and cleansing benefits of bentonite clay, which is firm enough to remove plaque from your teeth, but soft enough not to damage your enamel. To boot, the food-grade essential oils we include not only impart great flavor, but also provide antiseptic and antibacterial benefits. Our Coconut Toothpaste is fluoride, SLS, paraben and glycerine free, our stuff is all-killer-no-filler - so you'll only need a 'split pea' amount for each use! A little goes a long way! Up to 6 months of servings in one large tube. Fancy a face full of flavor so certainly wonderful your love will never waver? Our Rose Cacao Mint is the perfect match for you. Its delicate balance of chocolate mint and sweet rose will have you exclaiming too! "It's like a wedding party in your mouth," one taste tester proclaimed, while another said memories of french pastries are what remained in her mind as she brushed after dinner. Our Rose Cacao Mint is certainly a winner. Mint is great but could things be better? "You betcha!" our flavor wizard said, "follow this recipe to the letter!" A pinch of mint, then a dab of rich chocolate, a sprinkle of sweetness and it looks like we got it. Cinnamon! They cried, as we asked them a favor, what flavor should we add? Can you go ask your neighbor? Not to hot, but still spicy like your favorite gum. Nice and sweet, satisfying and familiar like those rolls made by your mum. This heavyweight is packed full of punch, it will last you forever, you don't use a bunch. Just a pea-sized amount per brush is all you need, this jumbo tube has 6 months of servings, yes indeed. Travel light, and keep your teeth white with this smaller delight. Our 72g tube will treat you just right, test out a flavor, or give one to your neighbor. Our smaller tube has 10 weeks of servings and travels well, though TSA service quality may waiver. Not one to settle on one flavor, maybe you want several to savor? Or you're the type to help out a friend, make sure they'll keep their teeth to till the end! Our Sample / Gift tube will last about a month and will have no problems with TSA or travel. The perfect, thoughtful gift for someone who has everything! Our paste is naturally tasty. We don't use artificial flavors or Xylitol sweetener which is often made from GMO corn and can be toxic to your furry friends. 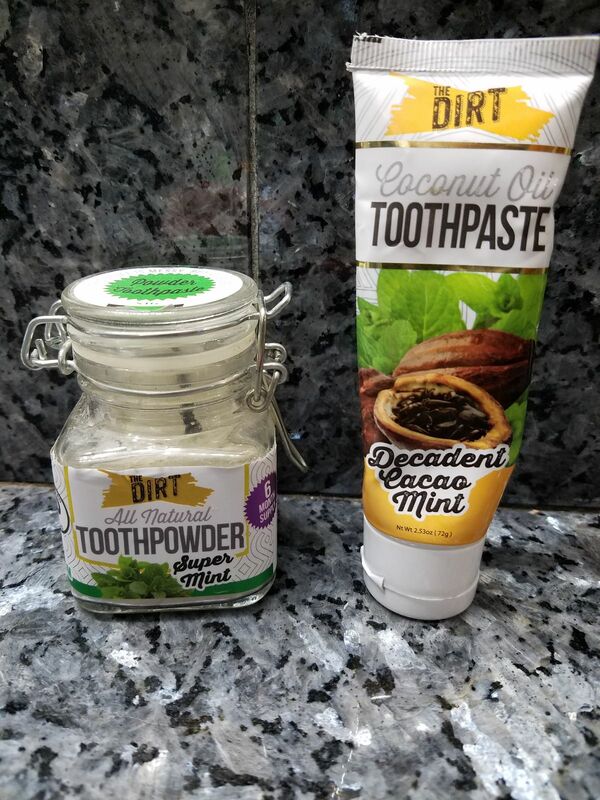 Our ingredients are so natural that The Dirt toothpaste is safe to swallow. So, grab yourself a tube of Dirt, and join us in making brushing awesome again! This is an unprocessed natural product. Color may vary from batch to batch and may tint white toothbrushes but won't tint your teeth. If you are sensitive to cinnamon we recommend trying our Cacao Mint or Rose Cacao Mint Toothpaste. Keep in dry place and replace lid after use. I liked it -- quite different from regular toothpastes. I love the flavor of both the toothpaste and toothpowder. Both have a light mint taste that is not overpowering and make your teeth feel super clean and less sensitive. I even have my 2 kids using the toothpaste. The tooth powder was too strong for my mouth, but the coconut pile toothpaste is great. I even recommended it to a friend with special dietary concerns. Toothpaste tastes great and works great too. I very recently started using this toothpaste. I bought the sample multi-pack of 3. I started with the cinnamon and it’s been a great experience. It makes my entire mouth feel very clean and refreshed and it’s also whitening my teeth. Bonus! I am so pleased with this product and very happy I came across it. I will definitely continue using it! Thank you for creating a toothpaste I can feel confident using without any harmful ingredients!